The Justus Liebig University Giessen was the venue for the DGE Congress this year. 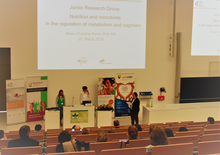 The competence clusters of nutrition research, which consist of DietBB, enable, nutriCARD and NutriAct, organized a mini-symposium on the main congress day. May 29, 2018 - DietBB Seminar Series: Self-control of eating - how does our brain choose food? May 09, 2018 - INSIGHT DietBB: Diet for Alzheimer's Prevention? Polyphenols give colour to flowers and leaves of plants and help to reproduce or to repel predators. But what do these compounds have to do with the prevention of diseases and how to investigate such a relationship? Johanna Rienks from TA 2 explores these questions. "If people like the change, they can change their behaviour relatively quickly", Professor Renner, from the University of Konstanz, opened the DietBB seminar on 19 March 2018. Prof. Dr. Bernd Weber, coordinator of TA5 in DietBB and member of the steering board, University of Bonn, reported on the competence cluster DietBB. At the Symposium of Nutrition Research Competence Clusters on 12 and 13 March 2018, the four clusters - enable, nutriCARD, NutriAct and DietBB - present the latest findings from nutrition research. January 30, 2018 - DietBB Seminar Series: Does the microbiota affect our energy homeostasis? This was the central question of the first DiebBB seminars of the year 2018. Dr. Filipe De Vadder, scientist at the Cancer Research Centre in Lyon, presented new findings on the interplay between microbiota and energy homeostasis to about 30 participants. January 22, 2018 - BAEN Café in December 2017: Can nutrition prevent dementia? It seems that nutrition can help to reduce the risk of developing dementia. This is the conclusion of the renowned speakers at the BAEN Café on 7 December 2017. More than 80 guests gathered at the fifth BAEN Café, organized by the Bonn Agricultural and Nutrition Network (BAEN) together with DietBB.